The first step is deciding when and how to tell your children about the move. Tell them as soon as possible. They are smart and overhear adult conversations. Make sure to tell them before they find out accidentally. Think about an appropriate occasion for telling them the news, one that will help frame the move as an adventure. Children will likely feel sad to leave friends and other families, all of which represent what is familiar and safe. As an extension of these feelings, children may be afraid that they won’t be able to make friends, that they don’t know the language, and that they are treated meanly. Creating a sense of predictability will reduce that ominous feeling about the new country. Do lots of preliminary reading and research with the child, and note some of the places the child would like to go. From very early on, portray the move as a new adventure, an opportunity to learn about different cultures, different people, and see different parts of the world. Having a plan brings a sense of security and structure despite it meaning a major change for your child. Candor and honesty are extremely important at this initial stage. Give the child enough developmentally-appropriate information so they feel comfortable to ask follow-up questions. But don’t overwhelm them. If parents don’t have an answer to a specific question, they can simply say, “That’s a really good question! I don’t have an exact answer for that, but how about you and I work together to try and find out?” In this way, you can relay to the child that it’s okay to feel concerned about certain issues surrounding the move but that it shouldn’t necessarily be considered a negative; instead, it can be positively re-framed as ‘part of the adventure’ – a fun exploration. Depending upon how children are raised – meaning how they feel about adventure, exploration, risk-taking – they will experience proportional levels of anxiety to a move. 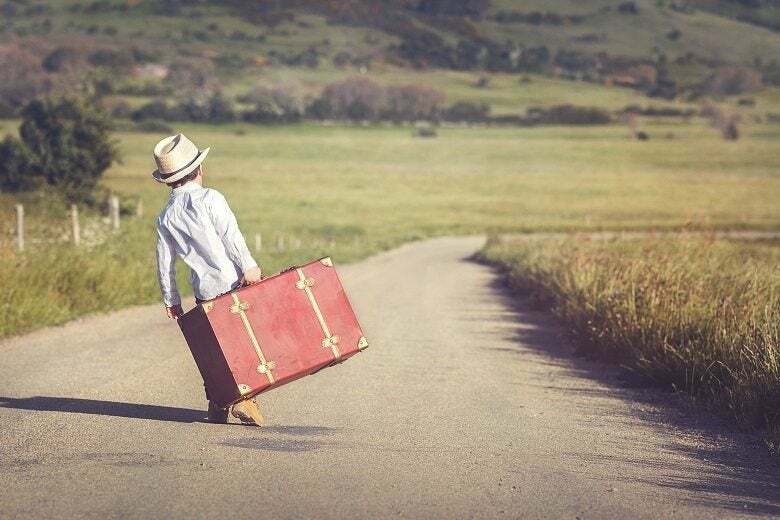 Children who have never travelled or participated in adventures may experience higher degrees of trepidation unless they are unhappy with their lives currently. NB: Risk-taking can include anything from trying new foods to going on outings. Try contacting your child’s new school or parent’s association so that your child can start communicating with another child prior to moving. This can help them feel that they will have friends in the new location. Once you arrive, talking to other parents in the neighbourhood and making introductions between the children can be a good idea but try to do it without the children noticing that you are doing it. Children often inherit a parent’s reputation, so the more confident and at ease you are, the better it will reflect on your child. Start with open-ended questions – i.e. “What do you think about us moving?” You will be surprised what they may be thinking such as, “Are we going because I did something bad?” Open-ended questions set the stage for a conversation based on curiosity and interest, not an agenda or judgment. Children may be worried about certain things such as leaving school, friends, home and their neighbourhood. Ask them if they have any specific concerns about moving. Some kids may not have any concerns at all and are looking forward to the adventure but they can sense apprehension if their parents have it and that will make them anxious. Make a list about some of the main questions the child has about the move. As time progresses, mark down answers to these questions so that their tangible progress can be highlighted. If the child is concerned about the school they’ll be attending try researching and printing pictures of the campus, to make the move more ‘predictable’. If they are worried about learning a new language, a brief list of vocabulary words can be created and reviewed each week together. Make it into a game. While children under ten-years-old can actually adapt far better than older children, it makes sense to give them as many choices and options (within reason) with respect to their lifestyle in the new country. Allowing your child to choose how they want their new room painted or decorated might help calm the child. Additionally, letting them decide on where some of the furniture and art will go in the new residence will also support them during a novel process such as relocation. Maintain the same rules and expectations of the child and your family culture. So many things will change in a short period of time, and the last thing a child needs is for his parents to start altering the rules of their parenting. Also keep all the same structures and principles of your family dynamic the same, throughout the transition. This should allow the child to feel as though they can at least count on the rules and norms of their family, even though other external variables have changed. Ask your child what they would like to do to say goodbye. Help them follow through on their plans. Some ideas include cards, play-dates, or a small party (or two, or three). Help them decide how who they want to keep in touch with and how. Show them how to collect and store email addresses and addresses. Have your child pack their own belongings and toys so they feel they are more in control of the process. Invite your children’s friends over to help with the packing and planning process. Children can make a scrapbook with pictures of their friends, home, and other memories. Parents can facilitate a get-together to allow the child to say goodbye in person to their friends. This can help your child say goodbye to their old home and friends. Scheduling 2-3 smaller get-togethers usually feels more legitimate to a child than having ‘just one chance to say good-bye’. It lets them say, do and feel what they need to do in order to feel a sense of organic closure. Make sure to have blank books so that other kids/parents can write well-wishes to the child. It will end up being a nice keepsake for the child. Additionally, make sure to take lots of pictures/videos. You could have cheap, disposable cameras, so that the kids can take their own pictures, too. It usually ends up being a positive and tangible product for the child to reflect upon as time progresses. Have some familiar items placed in your new home right away. This will help your child feel more comfortable faster. Pictures from the previous home, warm decorations, transitional objects such as stuffed animals can help make a child feel happy and safe. A child’s life soon revolves around school. Show them pictures or the website of their new school. Try to provide as much information about their new school as possible, including their new teacher. If possible, contact their teacher to speak with on the phone or Skype. Contact the school’s parent association and try to introduce your child to another child from that school. As a parent, a little bit of planning in advance will make a monumental difference in the comfort level of your child. Figuring out if there are other families with similar-aged children in the neighbourhood, in your new workplace, or – especially – asking the teacher at their new school for support in this process will allow you to set up play dates and get-togethers far in advance of the actual move. This sets up your child for success by initiating friendships and connections on their behalf before the move occurs. Pen-pal relationships with children in the destination country can build up a sense of excitement and surprise at meeting friends instead of anxiety and dread at being an outsider. Talking about the new country or city means getting information about it. This can mean learning the language, reading stories, listening to music and watching videos – all lots of fun! A list of true and false questions about the new country gives your child a 50-50 chance of getting the right answer and, if they don’t, they’ll get to learn about the new country anyway. If possible, take your children with you when you are visiting your new city or looking for a new home. The more they feel involved in the decision-making, the better. Make a list of all the things they want to do in their new city. Show them a map, YouTube videos, or take out library books about the city you will be moving to. Talking with other families from that location can be very helpful in finding out interesting places to visit. Learn the language! And make learning fun – sing a song in the new language or play a game. Give your child time and place to practice. Remember – unless you do it with them they will probably not have the confidence to persevere alone. Perhaps have them teach you a new phrase every day. Attending events and watch movies in the new language can be really interesting and give a sense of what it will be like in the new place. Many children will be very apprehensive and become clingy secondary to the transition. Younger children might exhibit a developmental regression and manifest tearfulness a fear of being alone. All of the preceding should be considered relatively normal as long as it doesn’t exist for an overly extended period of time or cause functional impairment across domains. Other countries may have mental health professionals that can help with difficult feelings in children. These are very common during a move, and so is a sense of frustration and, again, powerlessness. If these feelings persist and, for example, affects your child’s social life or performance in school, outside help can be useful. This might include mentorship, tutoring, therapy or visit a psychiatrist. Start with open-ended questions about how they have found the move and relocation. Ask your children about what you can do to help them settle. Make sure that home life is as settled as possible and stick to the same routines that you had before the move. Reassure your child that things will get better. Perhaps consider getting a new pet or taking up a new hobby. Maybe plan to visit your old home. “I encourage parents to view the notion of moving their family to a new country as a process as opposed to an outcome-oriented activity. There is a beginning, middle and final stage of the transition for most families with whom I’ve worked. Initially, set a positive tone but acknowledging that change is difficult. This confirms to a child that their feelings have value and that their parents will support them through the roller coaster of emotions they may be experiencing. The middle stage is generally more pragmatic and detail-oriented with respect to residence/school/interpersonal variables. Including the child in as much of all those variables as possible will provide the child with a sense of ownership. This reduces the senses of frustration, anxiety and powerlessness.